This coming week begins a new adventure for us in a few different ways. First, my family and I will be traveling throughout the Southeast (Mississippi, Florida, Alabama & Georgia) sharing the message of discipleship with churches, messianic congregations, home groups and individuals. It will be a short trip, but one which we believe will be fruitful. We look forward to meeting to people, making new friends and sharing the message of discipleship. The second exciting thing is the release of a booklet I have written on discipleship, called The Four Responsibilities of a Disciple. I feel it is a tangible "walk away" that will help both people who attend the meetings retain their understanding of these concepts, as well as get these principles into the hands of those who are not able to attend a meeting. It's a stripped-down version of my full book which, God-willing, I hope to eventually finish. Lastly, we have had an overwhelming number of people reach out to us with encouragement and support for our trip. We are very thankful to each and every one of you! Please continue to be in prayer for this coming week. As they say in Hebrew, Baruch Hashem! Or “Bless God!” We are so excited! We are pleased to announced that the Father has allowed us to release our first printed material! 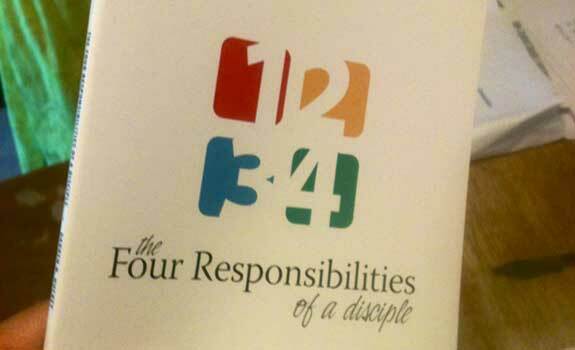 It is a seventy-five page booklet I wrote entitled, The Four Responsibilities of a Disciple. Over two years of studying, observing, implementing and writing has finally began to bear some tangible fruit which can help others on their path to becoming a Disciple of Yeshua (Jesus). We have already received an overwhelming response with our announcement of its release on Facebook. This booklet is a pre-release teaser of sorts previewing some of the key concepts that will appear in my forthcoming book on discipleship (which is still in the process of being written). We will soon have this product available in our online store. The main reason this booklet was published is that we found many people in need of a hands-on resource which they could use for both inspiration and reference in regard to personal transformation in the area of discipleship. This will be a tool which will help reinforce the principles being presented at our lectures on discipleship. The second reason for its publication is that we wanted to create an awareness of and an anticipation towards the future release of the actual book (which will contain much more material). We are hoping we will find people who would like to see this work completed and are willing to invest in its completion. This work first defines the concept of a "disciple" and "discipleship" from a first century, Jewish perspective. From there I present each of what I consider the four primary responsibilities of a disciple, dedicating one chapter to each responsibility. It is a concise and eye-opening look at discipleship from the perspective of BECOMING disciple, rather than speaking of discipleship in terms of evangelism.